Rage Against The Machine were involved in protests outside the Republican National Convention in Minnesota yesterday (02 Sept), after police cut power to the stage on which the band were due to play an impromptu set. The gig took place on State Capitol lawn, St Paul, with several other bands playing unhindered sets before authorities refused to allow Rage to play, claiming they didn't have a permit. 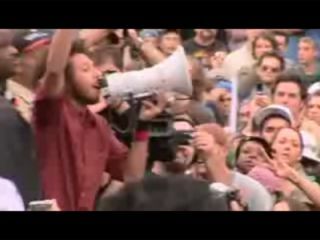 Angry but undeterred, vocalist Zack de la Rocha and guitarist Tom Morello delivered a cappella versions of the Bulls On Parade and Testify via a megaphone to a 2000-strong crowd. The band - famous for their politically-charged music and message - were also watched by swarms of riot police. Tensions worsened as the band reportedly joined the crowd to march on the nearby Xcel Energy Center where the Republican National Convention was being held. Tear gas was fired by police guarding the convention, leading to violent protests and the arrest of several activists. It's unclear as to how heavily involved members of RATM were in the protests - but it's certainly not the first time the band have clashed with authorities. In 2000, a similar protest gig outside the Democratic National Convention ended with police firing rubber bullets and tear gas on the crowd, and the band even closed Wall Street whilst shooting the video to Sleep Now In The Fire - directed by Michael Moore. You can watch footage of the Republican National Convention affair here. Alternatively, check out MusicRadar's podcast interview with Rage Against The Machine's guitarist Tom Morello.